United States based Visual Artist / Photographer. Thank you for viewing my page on Stuart Media Services. My thanks to Blair Stuart for this space on his wonderful website! I have quite a mixture of paintings and photos located at Fine Art America. An amateur Visual artist, I love to paint almost any subject. I have sold a few paintings locally as well as via FAA. Fortunate to have spare time to paint, having retired early from my teaching career. I taught second grade in the Hampton City School System for 24 years. "When I paint, it takes me into another world. I enjoy painting with acrylics because of the rich texture that I can achieve. 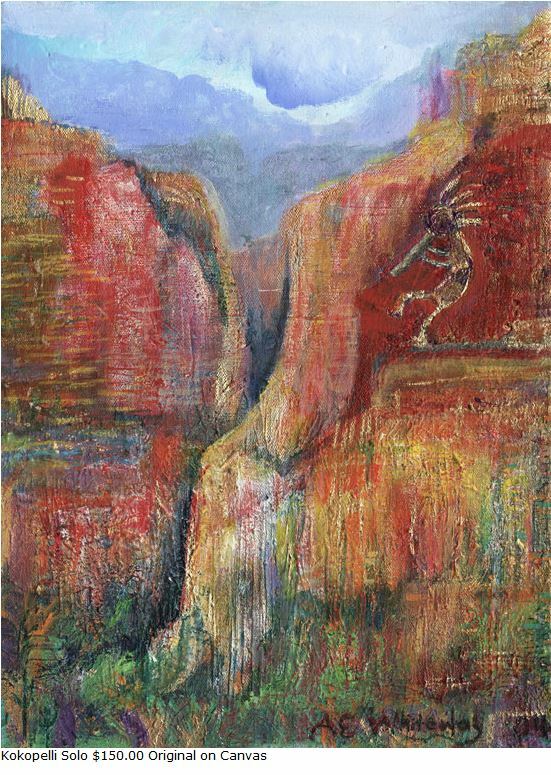 Many subjects inspire me to paint—scenes from the Southwest, florals, animals, and native American designs. 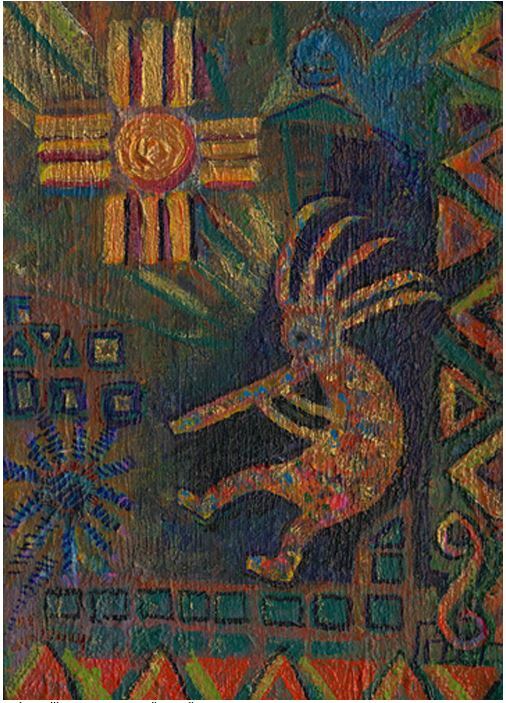 Whimsical subjects appeal to me, such as "Kokopelli," the mythical flute player of Native American folklore. My father, Edgar Lee Turner, who was an accomplished portrait and landscape painter, encouraged me to learn to paint after I retired from teaching second grade. I also owe my enthusiasm for painting to Valeria Wilson, Artist; and Taunya Tae Waxham, Artist. Having a circle of devoted friends who paint together each week is a delightful way to keep interested in different styles and techniques. My husband Don and I live in the county of Isle of Wight with our dog "Happy" and our cat "Bob." "I hope my creations transport you into a peaceful place, because that's where I am when I am painting." Following is a list of the images that I have on my FAA website. The list is not in any particular order. 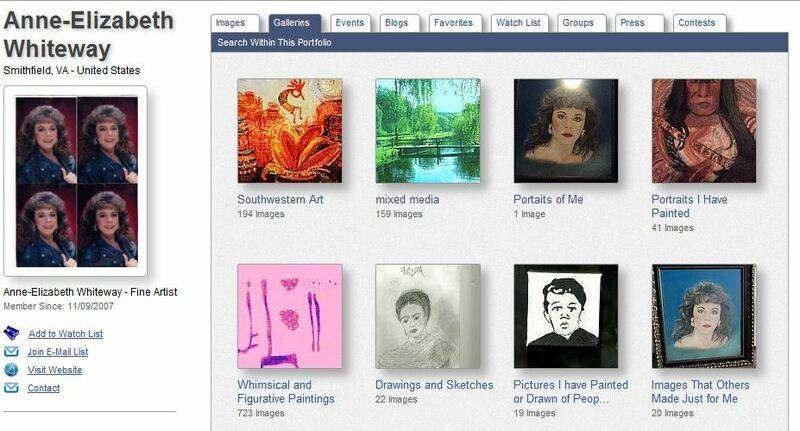 However, when you visit my Website you can click on 'Galleries' to see my paintings/photos in an organized way. 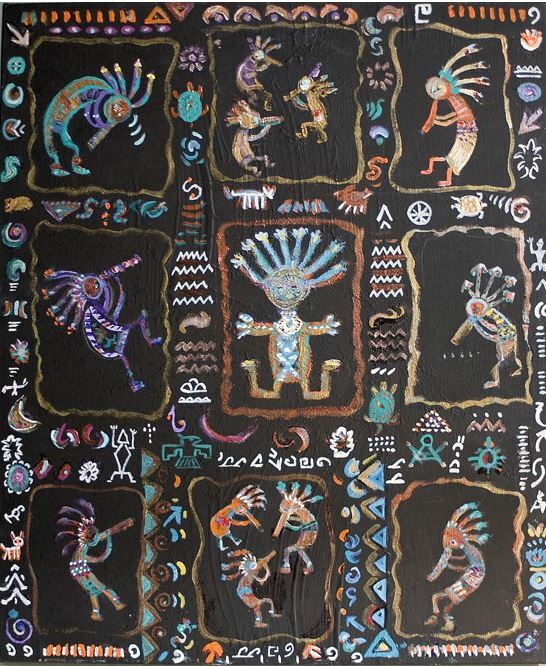 l. Southwestern scenes and Southwestern/Native American themes, especially featuring a lengendary figure: 'Kokopelli'. 2. Works purely from my imagination, including a variety of subjects. 3. Animals, including cats, dogs, elephants, giraffes, birds and butterflies. 4. Experimental : One example of experimental would include painting on Braille paper, yes Braille paper from Braille books..
5. Scenes from nature, realistic or expressionistic scenes. One example would be 'Autumn Hideaway'. He painted Mona Lisa, The Gleaners, Blue Boy and many other copies of famous works. However, he could paint just about ANYTHING that he saw. He painted portraits of family members, including my brother and myself. He could paint outdoor scenes that are so real looking that I just don't know how to describe them unless you just come over here and I show you the ones that I have... for example: 'Mabry Mill'. One of his favorite subjects to paint was my dear and much missed and loved MOTHER, Anne Young Turner. She was a beauty. The paintings that my father painted are not for sale. However, I felt that this venue would be a good place to show some of his great artwork. Note: if you type in 'www.anneelizabethwhiteway.com' you can go to other links to my work. Thank you for reading this and may God bless you. One cannot but feel a sense of peace and solitude when viewing this enhanced photo. This is a Christmas card front. I love it so much I just had to show it to you. No, I did not paint this. It is not for sale because it is not my own work. On the back of the card it does not indicate the artist. In any case, I hope you enjoy seeing this card. In my spare time I like to doodle as well as paint. Sometimes my doodles turn out to be paintings..
Joyful Joyful is the title because I have included happy expressions in this. I just noticed it looks like a bird in this painting. Do you see it? This is fourth in my "Celebration" series. Butterfly Meets Fish is a collage in which I used a refrigerator magnet butterfly and enhanced the colors. Then I laid this on a watercolor painting of yellow fish. Oh, what fun it is to create collages. I hope you enjoy seeing this as much as I enjoyed putting it all togehter. Good fishes, I mean WISHES to all who see this. My father painted this from the scene, or so I have been told. I am lucky enough to own this now. If anyone is interested in purchasing a copy, please tell me. I can set this up on FAA for copies. not ever sell the precious original...not only because it is good but because "Daddy" painted it. HE is gone now, but his works of art continue to have his spirit & a life of their own it seems. When I was growing up, I took for granted what he was doing in his spare time If I could do it over again, I would have asked him to let me watch him paint sometime. He did not use any fancy equipment. An easel, oil paint, brushes & a palette - along with his innate talents & abilities...that's what he used. This is a painting which I did with acrylics on thick paper. Echo Lake is the name of our street. This is the second time I have uploaded this because I want a clearer view.